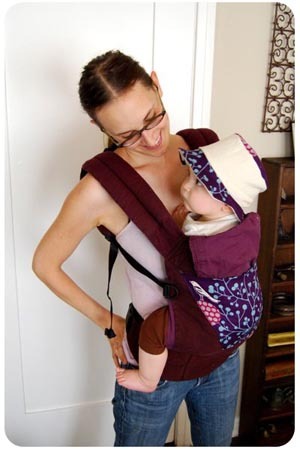 I adored my Ergo baby carrier, especially as my son got heavier. If I'm honest with myself, I'll admit that it is truly was my most used carrier, a trusty standby. However, it was also the least fashionable and looked like a backpack. Time for a facelift! I had the 2007 black with cranberry lining edition as shown in the photos. It was incredibly comfy but boring looking. I drooled over other similar soft structured carriers that came in fancy prints and colors but they never fit me as well. Plus it was hard to justify buying yet another carrier when my Ergo was perfectly fine, only not as exciting to look at and was getting a little worn in. 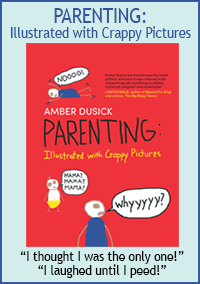 What is a crafty mama to do? Alter it until I love it of course! 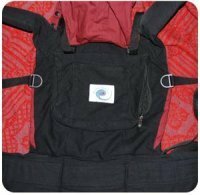 **Please Note: Altering an Ergo baby carrier (or any carrier for that matter) voids the manufacturer's warranty. Pocket Removal - I opted to remove the pocket completely because I didn't like their style of pocket (again, too "backpack" looking) and I wanted to use the pocket as my test fabric for the dye bath. I used a seam ripper and carefully removed the pocket. This took about five minutes. Color Stripping - You are in luck if your carrier is already a light color such as camel because you can skip this step and go straight to dyeing. Starting with black means that the color needs to be stripped in order for it to take any other dye colors. I used Dharma's Color Remover on the pocket as a test and had to do it multiple times. It took a long time and from black it only turned dark brown after hours of stripping. Make sure you rinse very, very well and use proper ventilation. If you want to have an extreme color change from black or any other dark color you'll need to use bleach. Please be very careful when using bleach on fabric because if you use too much or leave on for too long it can damage the strength of the fabric. Not something to be taken lightly when you are dealing with fabric that needs to support the weight of a child. Start out with a small amount of bleach (1 cup mixed in 3 gallons of water) and do a test on your pocket first, before bleaching your entire carrier. Make sure you rinse very, very well and use proper ventilation. Dyeing Ergos - The end result of your carrier depends on the beginning color. You simply can not get a light pink color from a blue fabric for example. However, if you dye your blue one red you'll get a nice purple color. The camel/beige color dyes the best but even that color has a brownish/yellow undertone to it. This means that dyeing it blue may look slightly blue/green and dyeing it red might look slighty orange/red. Again, if you remove your pocket you can use it to test your dye colors. If you don't plan on re-attaching your pocket you can even cut it into smaller pieces and do several tests until you find a color you like. I do not recommend dyeing in your washing machine because the straps float. You'll need to be right there to submerge them and stir. I used a very large tupperware storage bin in my bathtub for my dye vat. I used Procion Dyes and followed these instructions only instead of the washing machine I hand stirred in a large plastic bin. My carrier start color was a dark brown (after color stripping from black) so I dyed it deep purple. The brown tones plus purple created a lovely deep plum color. After the dye process was complete, I washed several times until the water ran perfectly clear and then I washed a few times in the washing machine too. I didn't want any dye residue in my carrier. Adding Pockets - This is the fun part! Now that you have an all new color you can pick out a coordinating or contrasting pocket fabric. The style of your pocket can be anything you like, a plain square or rectangle shape or get fancy. Mine is a simple, open top pocket, but you could easily create one with more compartments and snap, velcro or zipper closures. 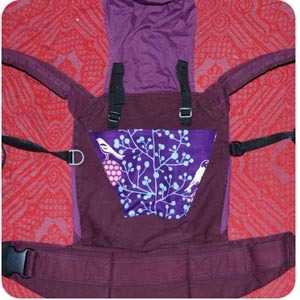 The pockets are sewn directly through the body of the carrier and most sewing machines can handle this thickness. Of course, you can hand sew as well as you like since the pockets are not very large. More... - Of course I couldn't resist sewing a matching hat! You can use this free baby sun hat pattern for the matching hat to babywear in style. 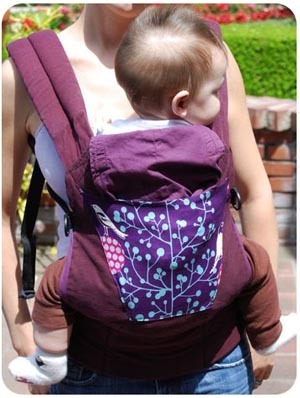 Back to the top of the Dye an Ergo Baby Carrier page.